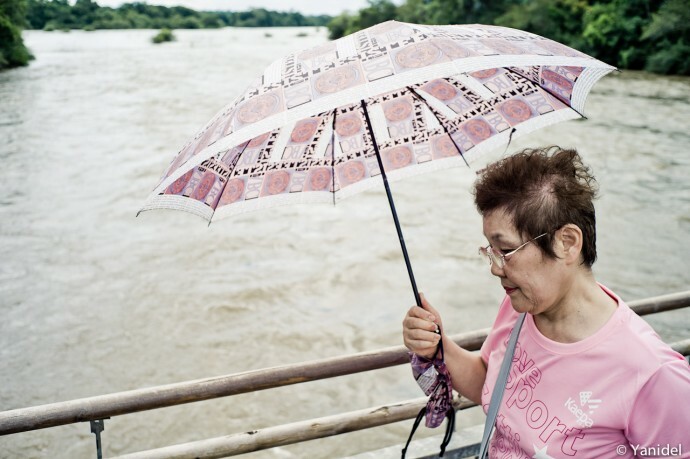 When one refers to street photography, the urban environment comes straight up to our mind. Indeed, many of the most famous photographers hunted in the streets of large metropolis such as Paris, New York or London. Yet street photography can really be performed in any place, be it a small rural town, at the beach or why not, at the South pole. Street photography is above all about how humans interact with their environment, candidly in front of the eyes of an unknown witness. This being said, some locations are definitely more challenging and will put your imagination and patience at work. 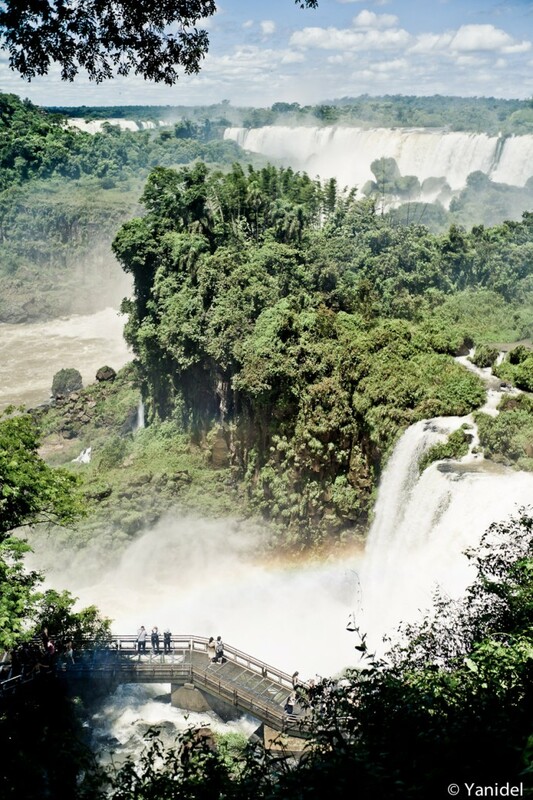 This is exactly the exercise I went through last week while visiting the Iguazu Falls. Yet before I go into more details, let me precise that I don’t have the state of mind to be a landscape photographer. Actually, I don’t even enjoy shooting landscapes as I always get the feeling that I can get much better picture of a same scenery by searching on the internet. And even if I were to shoot landscape, I would not have the patience to look for the perfect composition and wait for the best light. No, I like the unplanned and instinctive side of street photography, that moment that lasts a split second before it is gone forever. 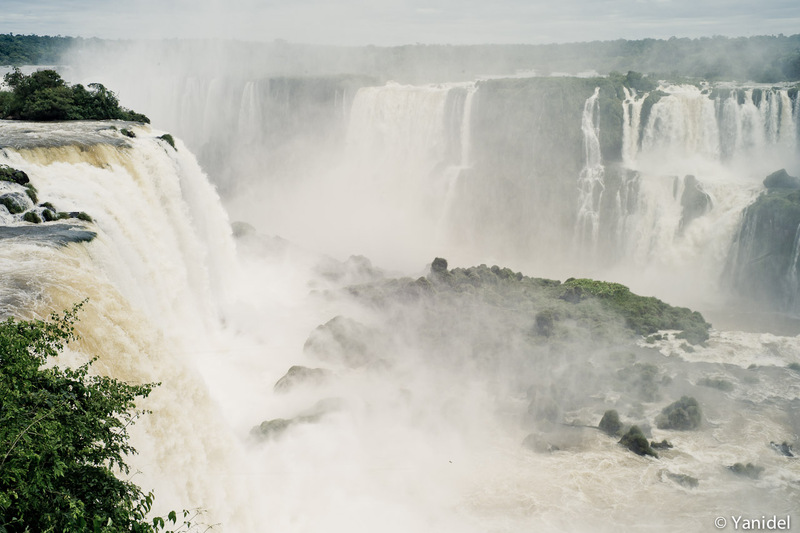 So imagine my reaction when we arrived at Iguazu Falls and faced the following scenery (and yes, this is is a landscape shot). After a few minutes of silent contemplation in front of such a stunning sight (Iguazu Falls is in the ballot to be part of the 7 new world wonders), I put my my eyes at work and tried to find a few street shots. 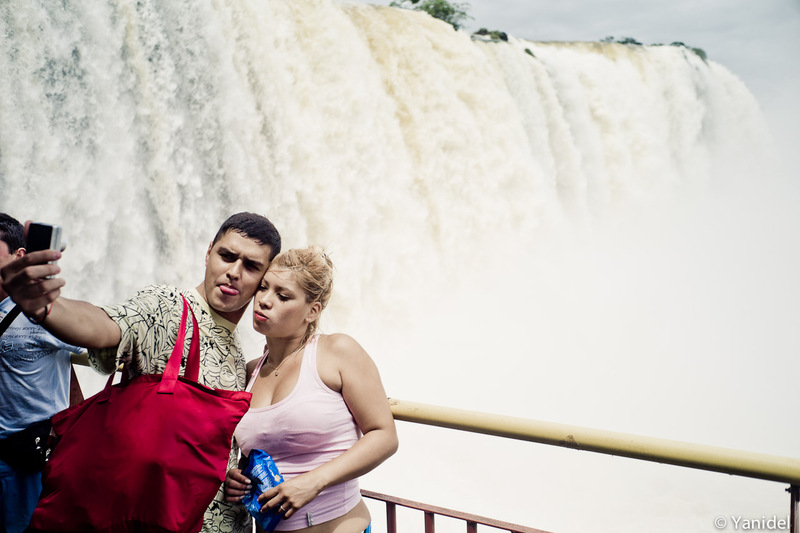 After two full days of shooting at Iguazu Falls, here are therefore a few impression and tips about how to give a street photography spin to the visit of a landmark. In a landmark, most of your subjects will be tourists. This basically means backpacks, horrible clothing, sunglasses, cameras and all these so un-photogenic accessories that tourist like to carry around. The master of these kind of scenes is evidently Martin Parr who portrayed them and their behaviour with a lot of humour and a touch of irony (not too call it sarcasm). Obviously, the goal is not to replicate Parr’s work but it will definitely keep you busy as tourists are endless material in terms of look and behaviour. Integrate the landmark in your scenes. Though I don’t like to shoot landscapes, I tried to compose my shots with Falls in the background. Indeed, it will give quite an unusual feel to your “street” shots, especially when surrounded by so much beauty. Also, try to give an impression of the special characteristics of the site you are visiting. 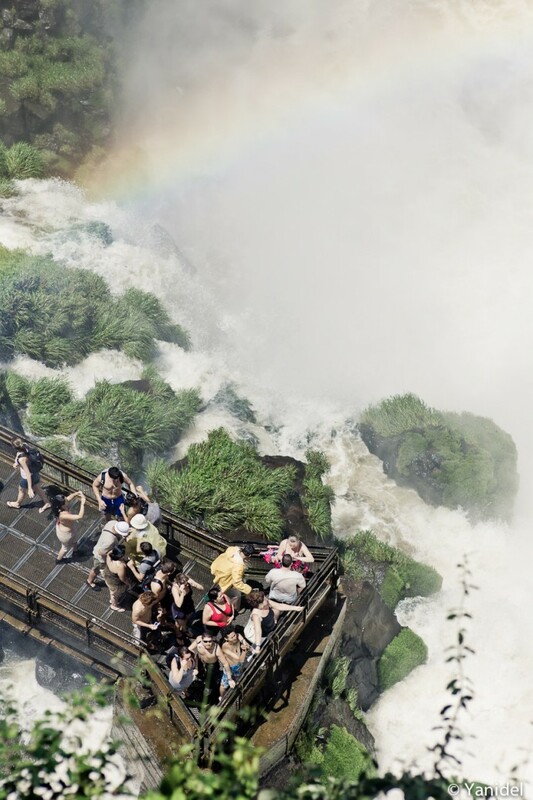 In the case of Iguazu Falls, there was evidently a lot of water and mist, so many people wore raincoats to approach the some of the viewpoints, even on this very bright day. 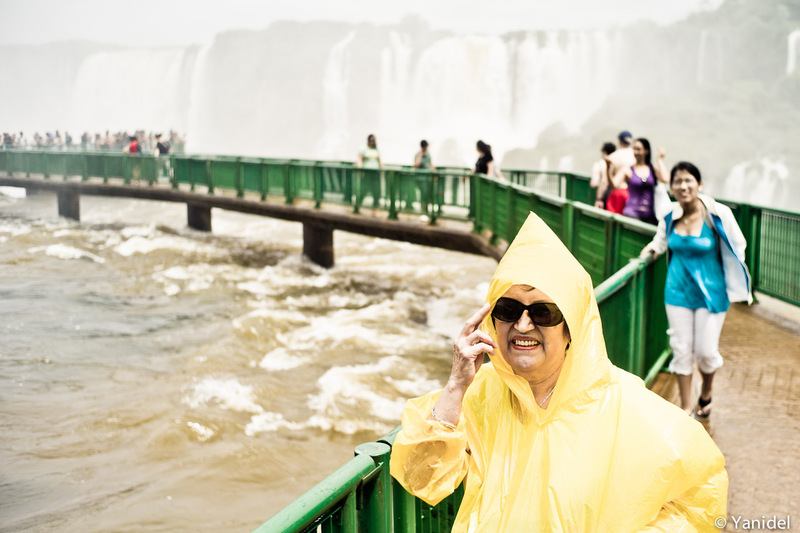 Yet at the same time, another tourist would suddenly appear with an umbrella to create quite a surrealistic vision. 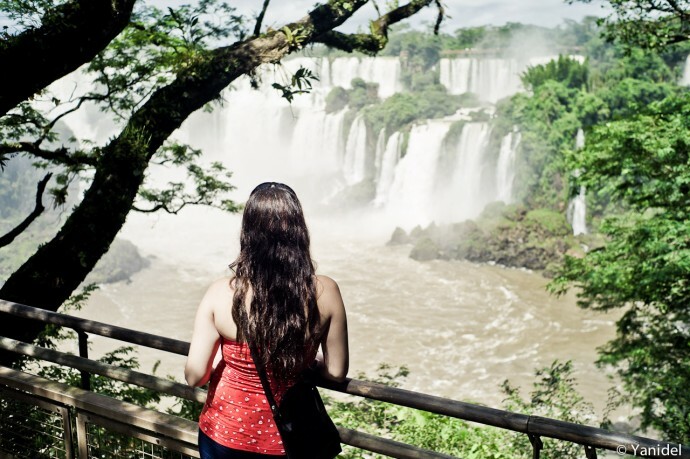 When you stand next to one of the 280 waterfalls of Iguazu, you do feel like a tiny little being in front of mother nature. Try to portray that relationship of man vs landarmark. The two pictures below aimed at the same part of the scenery, that is a bridge that led at the bottom of a waterfall. The first one was taken with a wide angle and shows the impressive size of the scenery compared to humans. 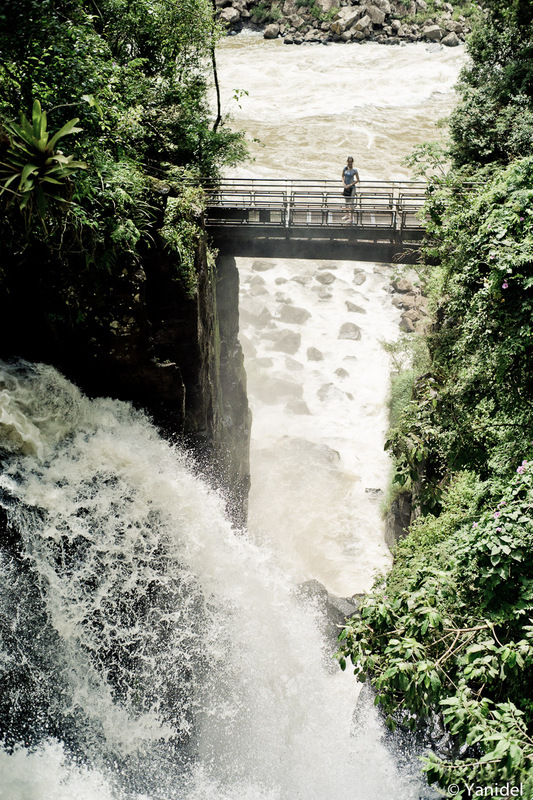 The second shot was shot with a 90mm lens and is a close up on the end of the bridge, flattening the waterfall. Nevertheless, in both cases, death was only a jump over the barrier away. If your home playground isthe 5th Avenue or Les Champs-Elysées, you will obviously lose some of your marks. Yet it does not mean that you must forget about your photographic universe and style. Stay true to what you like and try to integrate it in the scenery. No need to mimick Parr, HCB or Salgado, apply your style and try to bring a new take on the scenes you’ll face. I consider my photographic world to gravitate around lyricism and mysticism. As for my style (if it can be called so), I would say it is mostly a mix of thin depth of fields, high vintage point and a specific post processing. I would be greatly honored if one day someone says “this is a Yanidel shot” while looking randomly at one of my Iguazu shots (Time to wake up now). The last photo is fantastic and truly depicts the significance of man on earth. Im just sayin….. Another great installment in your series. Looking forward to the next update. Thanks Wolf, I feel honoured. 2 & 4 in this sequence are unmistakeably Yanidel shots. (I love 4 in particular) Your style is quite easily recogniseable. In fact I can easily recognise particular traits in my own photographs which show a definite ‘Yanidel’ influence. Photos 33 & 34 in my street gallery are good examples. I don’t know if I would have taken these photos if I was not familiar with your work. Hi Steven, I guess we all influence each other in some ways. Influence comes also from paintings, movies, theaters, a sum of inconscious souvenirs that make us organize shapes and colors instinctively. The thing is not giving it too much after thought, a style comes by itself, not analyzing it. Very difficult exercise. On this type of spot, street photography just became bad tourist photography in most cases.